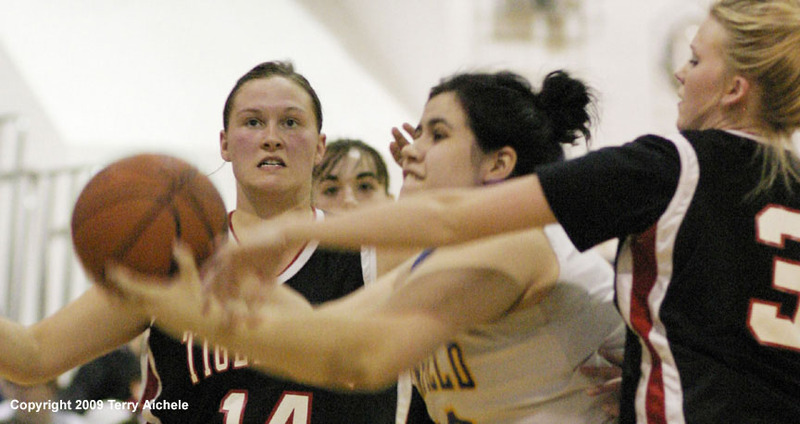 Mikayla Baros grimaces as she powers her way through Weston-McEwen defenders. STANFIELD - The Stanfield Lady Tigers (7-7 Blue Mountain League) celebrated senior night with a win over Weston-McEwen (4-10 Blue Mountain League) by a score of 47 to 36. 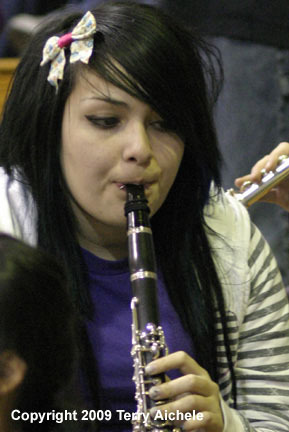 The game was played Friday, February 13, 2009. The Tigers will be going to Pendleton to play Heppner in the first round playoffs. The first period was low scoring. Mikayla Baros set the tone for the game leading the scoring in the first period. She hit five freethrows and short shot during the period. Fellow senior Erica Gehrke stole a Tiger Scots pass and drove in for a layup. That was the total scoring for the Tigers. 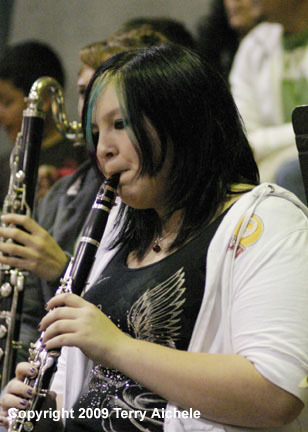 Scorers for the Tiger Scots included Nichole Zeller who hit a foul shot and two short shots. Stanfield led at the end of the first 9-7. 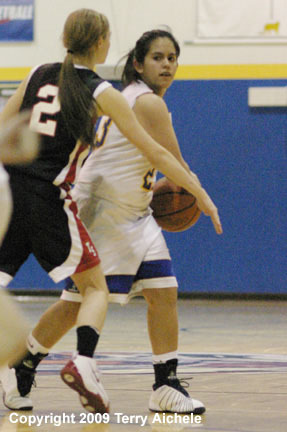 Stanfield's Mikayla Baros continued her hot streak in the second period aided by Jessenia Carrillo. Weston-McEwen were held scoreless for nearly five and a half minutes. Tiger Scot Sydney Porter finally broke the ice followed by Nichole Zeller. Stanfield led at halftime by seven, 18 to 11. The third period had Jade Martinez and Nathalie Cook joining fellow Tigers Baros, Carrillo and Gehrke in scoring. Tiger Scot scorers included Nichole Zeller, Tiffany Cain and Morgan Entze. The Tigers stretched their lead to 10 points 32 to 22. The fourth quarter had the teams committing a total of 13 fouls. The Tigers outscored the Tiger Scots by only one point, 15-14 maintaining their strong lead from the third. Tigers scoring in the fourth included Carrillo, Martinez, Baros, Gehrke with freethrows and a trey. 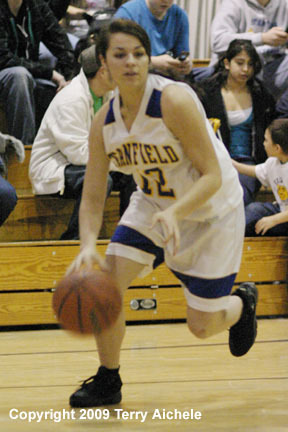 The Tigers concluded the Blue Mountain Conference season in fourth place earning them a playoff game with fifth place Heppner (6-8) on February 20, 2009 in Pendleton at a time to be determined. The BMC top three are Union (14-0) at number one, Enterprise (12-2) at number two and Pilot Rock (9-5) at number three. 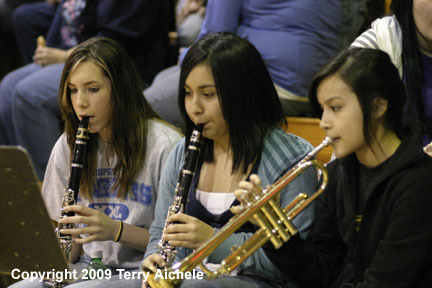 LEFT - Three members of the Stanfield Pep Band play during a break in the girls game. 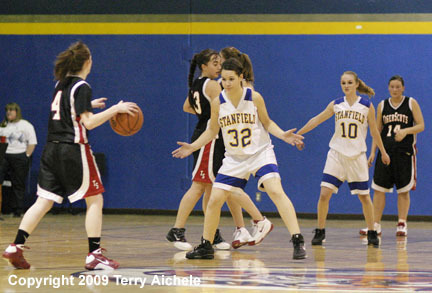 RIGHT - Senior Jessenia Carrillo of Stanfield leads a break up the court. 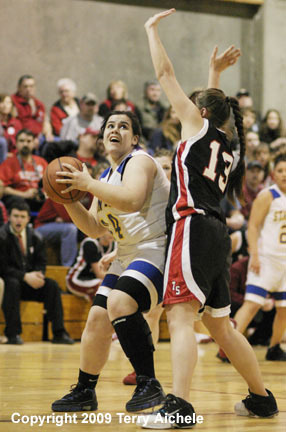 LEFT - Stanfield's Mikayla Baros spins towards the basket for a layup. 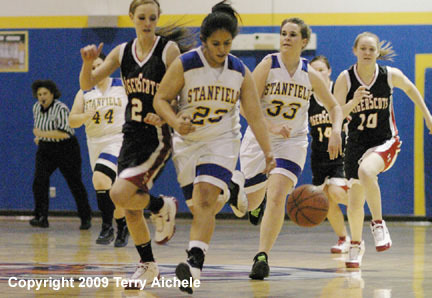 RIGHT - Jessenia Carrillo of Stanfield is closely guarded by Sheridan Cain of the Tiger Scots. 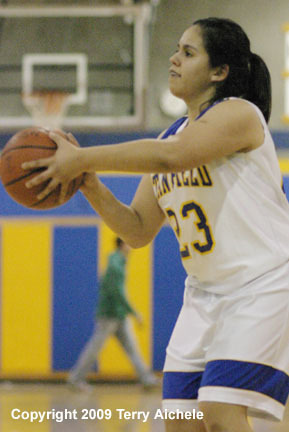 LEFT - Jessenia Carrillo of Stanfield prepares to take a shot. RIGHT - Senior Erica Gehrke brings the ball around a Tiger Scot defender. 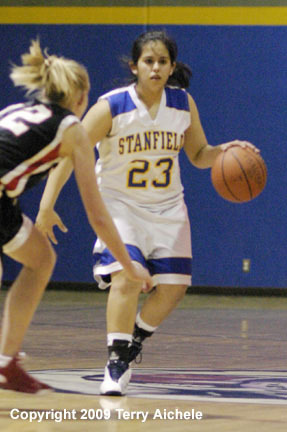 LEFT - Jessenia Carrillo of Stanfield looks for an opening. 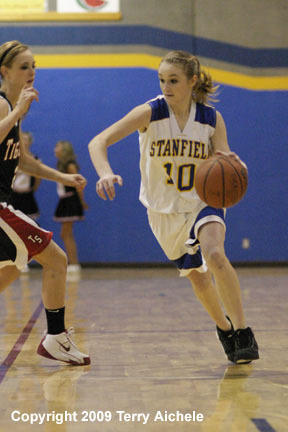 RIGHT - Jamie Erwert of Stanfield sets up to defend against Chantel DeWitt of Weston-McEwen. 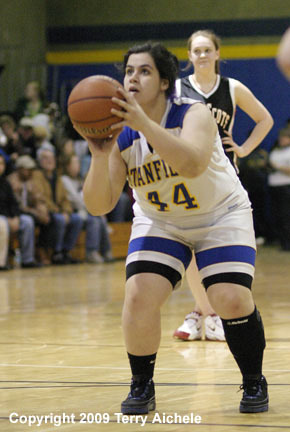 LEFT - Stanfield senior Nathalie Cook moves the ball into the Tiger Scot zone. 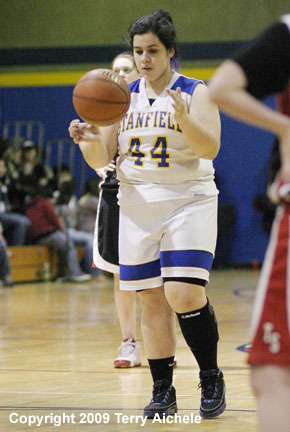 RIGHT - Mikayla Baros of Stanfield goes through her pre-freethrow ritual.